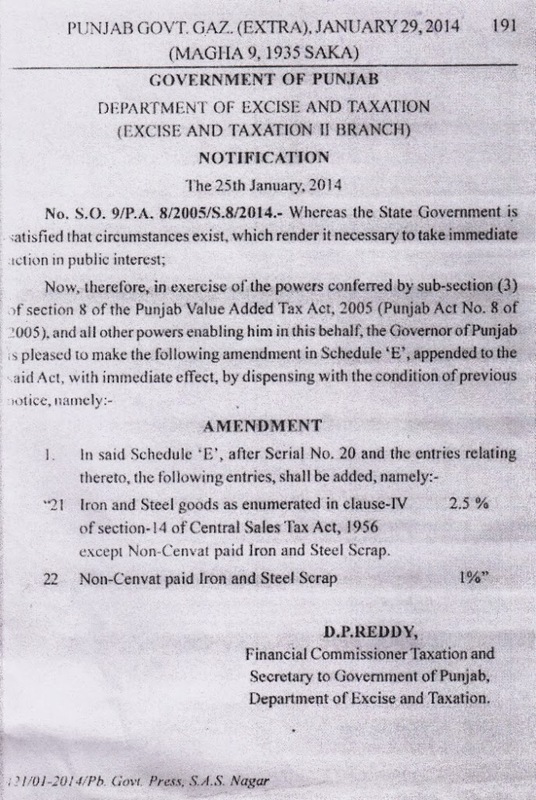 Punjab Government has notified reduced rate of tax on Iron and steel goods as defined u/s 14 (iv) of Central Sales Tax Act, 1961 from 4.5% to 2.5% except on Non-CENVAT paid scrap. Non-CENVAT paid scrap has been made taxable at the rate of 1% only. This change has been made effective from 25.01.2014. The additional tax i.e surcharge of 10% u/s 8-B of Punjab VAT Act, 2005 will be chargeable extra in addition to the above reduced rate of tax. Thus effective rate of tax after adding surcharge @ 10% on iron and steel goods except Non-CENVAT paid scrap, will be 2.75% and on Non-CENVAT paid scrap it will be 1.1%. However the term "Non CENVAT paid iron and steel scrap" has not been explained in the notification. CENVAT means Central VAT. It should be noted that CENVAT is never paid but credit of duty paid is considered as CENVAT. In such case what is the meaning of this term is not clear from the notification. However in the absence of any such explanation it should mean that if CENVAT credit is taken on Iron and Steel scrap then the rate of tax would be 2.75% and in case CENVAT credit on scrap is not taken then the rate of tax would be 1.1%. This change has been made w.e.f 01.02.2014. Advance tax levied on all goods of iron and steel at reduced rate: Punjab Government has also reduced the rate of advance VAT from 4.5% to 2.5% on all iron and steel goods covered u/s 14(iv) of the CST Act, 1956 except wheels, tyres, axles, wheel sets and Non CENVAT Paid scrap. On Non-CENVAT paid scrap rate of advance VAT is 1%. Surcharge is not applicable on the rate of advance VAT. 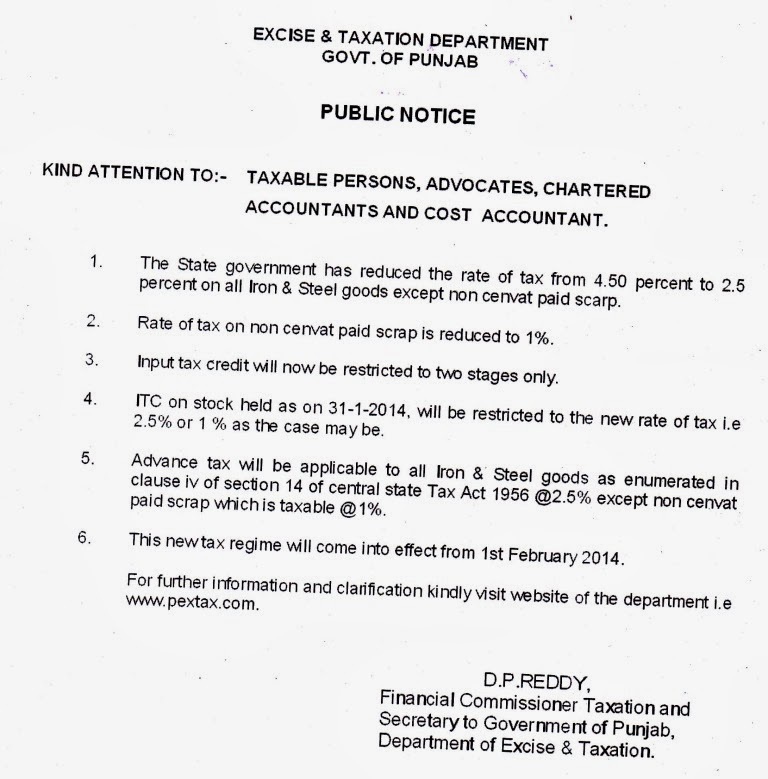 Advance VAT is applicable w.e.f 01.02.2014. 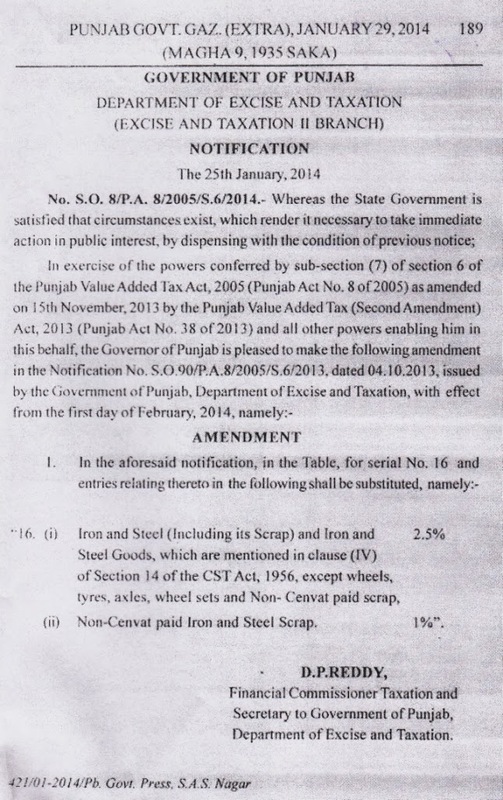 Input tax credit on iron and steel available only till two stages:Another important amendment which has been made in rule 21 of Punjab VAT Rules, 2005, is the restriction of input tax credit of tax paid on iron and steel goods except wheels, tyres, axles, wheel sets, upto two stages only. By notification No. G.S.R.5/P.A.8/2005/S.70/Amd. (53)/2014 dated 25th Jan. 2014 Rule 21 and Rule 54 have been amended. 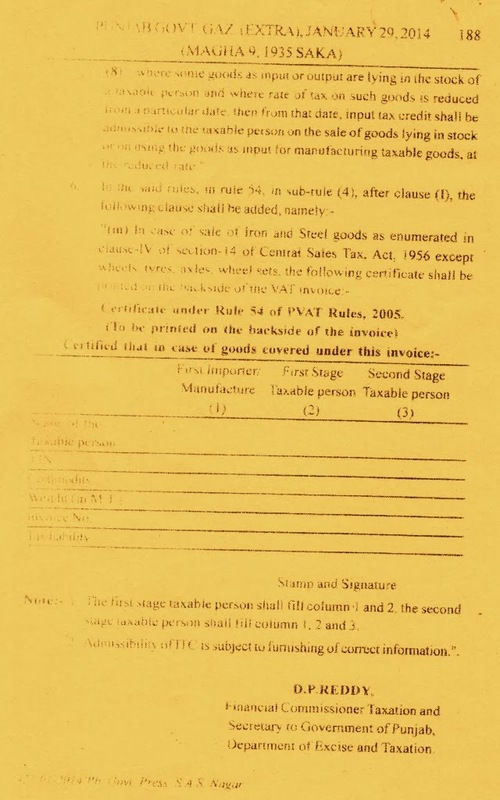 As per new rule 21(7) input tax credit in the case of iron and steel goods as enumerated in clause-(iv) of section 14 of Central Sales Tax Act, 1956, except wheels, tyres, axles, wheel sets shall not be available unless the purchaser is a first stage taxable person or second stage taxable person. (ii) an importer of goods from outside the State of Punjab. Second stage taxable person has been defined in Rule 2(hhh) to mean as a taxable person who purchases goods from the first stage taxable person. "A" manufactures iron and steel goods and sell it to "B" after paying tax @ 2.75%, B sells the same goods to "C". "C further sells the same goods to "D". In the above example Input tax credit on the above goods will be available only to B and C. D will not be eligible for input tax credit of tax charged by C.
The above amendment is not applicable on wheels, tyres, axles, wheel sets covered u/s 14(iv) of CST Act. The amendment is applicable w.e.f 01.02.2014. 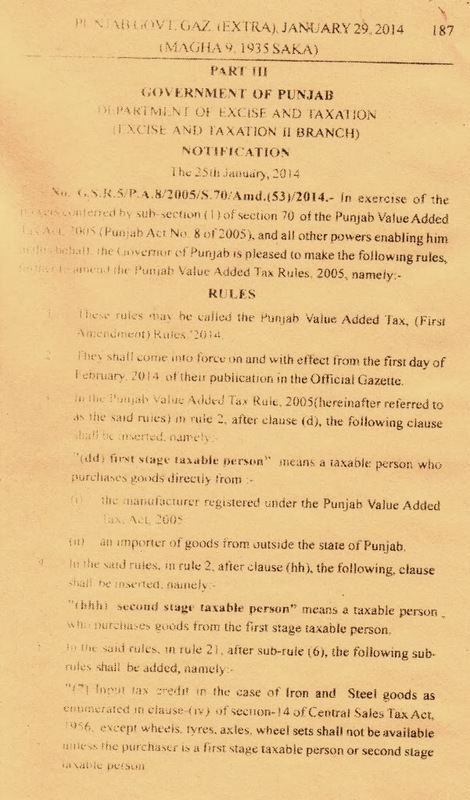 Input tax credit on earlier stock restricted: Rule 21(8) of Punjab VAT Rules has also been added which provides that where some goods as input or output are lying in stock of a taxable person and where rate of tax is reduced from a particular date, then from that date, input tax credit shall be admissible to the taxable person on sale of goods lying in stock or on using the goods as input for manufacturing taxable goods, at the reduced rate. Thus it means that input tax credit on the stock of iron and steel goods as on 01.02.2014 will be available at the reduced rate of 2.75% and of 1.1% only as the case may be. Certificate to be printed on the back of the invoice: Rule 54 of Punjab VAT Rules, 2005 deals with the particulars to be mentioned on a VAT invoice. A new clause (m) in Rule 54(4) has been added, which prescribes additionaly a certificate to be printed on the back side of VAT invoice in case of sale of iron and steel goods as enumerated in clause (iv) of section 14 of CST Act, 1956 except wheels, tyres, axles, wheel sets.